Assess the cost and margin positions of operating chemical plants according to geography, capacity, time, technology, feedstock, operating rate and integration level. How confident are you in your ability to evaluate the long-term competitiveness of operating plants? Download Brochure Chemical Competitive Cost & Margin Analytics. How do our clients use the Chemical Competitive Cost & Margin Analytics service? How will new capacity additions affect the competitiveness of my existing operating plants? Who are the most cost advantaged and disadvantaged producers? Is my capital investment viable in the long-term? What is the feedstock cost advantage of an integrated plant? How will a shift in oil, feedstock or chemical prices impact competitiveness? I need to renegotiate contracts ─ what are the upstream and downstream cost structures in my value chain? ** IHS Markit will be increasing the products offered to build a full library of solutions. For products of interest not listed above, please contact us. 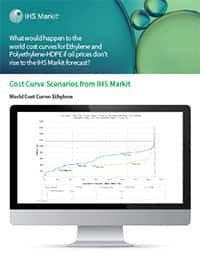 On-line access to historical and 10-year forecasts of chemical production capacity data, supply/demand balances, country-by-country trade grids and 10-year price, cost and margin forecasts. Certain studies also provide production economics, production process and technology overviews as well as derivative capacity data and analysis, and summaries of the strategic issues, sensitivities to the forecasts and emerging trends impacting global and regional markets. The interactive tool allows companies to determine and validate the optimum capital investment, by evaluating how state of the art commercial and emerging processes compare and compete, across a variety of real world environments and hypothetical situations. Interrogate up to 500,000 economics data points, and adjust the analysis based on technology, capital and production economics, time, total project cost, geography and environmental impact to understand the viability of future projects. In-depth, independent technical and economic evaluation with user-interactive models of over 2000 commercial and emerging technologies for the chemical, biochemical, and refining industries. The service provides analysis of the impact of changes in processes, feedstocks, energy prices, and government regulations on chemical and fuel production economics for our clients.